So the work on the kitchen at Conviven has finally begun. The builders have moved in and started the task of renovating a much worn down kitchen. It has begun with enthusiasm from all quarters: Carmen, the "housekeeper/cook/guardian of children and building” is over the moon about a new kitchen from which to work from, the volunteers can see the new beginnings of an essential part of the Conviven center and the children look on with bemusement at the dust and banging. Walls have been knocked down, and a start has been made on redoing the plumbing system. The grand plan is for a new sink, for ceramics to be placed around the kitchen and sink which will make cleaning and hygiene far easier to deal with. There will be new work surfaces and cupboards. A ventilator is going to be installed and the very antiquated gas pipes are going to be dealt with by a gas specialist. There will be new lights and plugs also put in. To help the cause of the kitchen we wore white and sported great hats last week at a fundraiser party at Bella´s house. It was a great success and 1700 pesos were raised. However starting to renovate a kitchen is no mean feat and it is clear that a kitchen is made of two parts. The actual room, and the objects that make it up. There is a pressing need for a new oven as the present one is far too old. So if anyone could donate towards that or even has an oven to give we would be very grateful. Equally Carmen has pointed out that there is a need for a door with a lock to the kitchen so that children don’t wander in and get hurt. 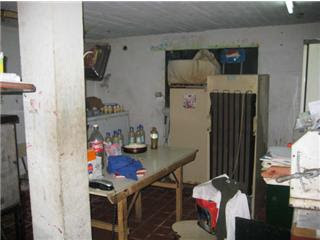 The kitchen at Conviven lies at the heart of the center, and so any help would massively improve the children’s experience whilst they are here, and of course aid Carmen’s task in looking after them all. The volunteers are awaiting the day when they can get stuck into pots of paint and decorate it. For the moment however, this big project has finally begun. I wanted to pre warn new volunteers in plenty of time that the big summer holidays start here around the 16th of December and last till the beginning of March. Most children in Buenos Aires will leave the city for some of this time to avoid the heat and get some fresh air. Even the kids from the villas who come to Conviven for english classes will get a chance to go to summer camps which are organized by the state. They tend to go away to camp in January so this is why there will be no volunteering opportunities avaliable in this month. If you are planning a trip here and wish to volunteer please keep this in mind.